Ram Charan, Jr NTR, Allu Arjun, Chiranjeevi and a host of other Tollywood celebs to cast vote in the Lok Sabha elections in Hyderabad and their photos and videos are going viral on social media. Megastar Chiranjeevi, Ram Charan, Jr NTR, Allu Arjun and a host of other Tollywood celebs to cast vote in the Lok Sabha elections. They share their photos and videos and also urged fans to exercise their power in this polls. Many celebrities became role models for their fans, by taking some time out from their busy schedules for elections. Along with their family members, they visited polling booths this morning, waited in queue like every other common voters and exercised their power. They posed for camera with their inked fingers, shared those pictures and asked their fans not to forget to vote this electons. Megastar Chiranjeevi visited the polling booth with his family members like Surekha, Sushmita, Ram Charan and Upasana Kamineni. The pictures and videos of the mega family waiting in queue hit the social media and went viral immediately. Later, Cherry shared the photos of the inked fingers of his and his wife on Facebook and wrote, "Go vote!! It is important!! 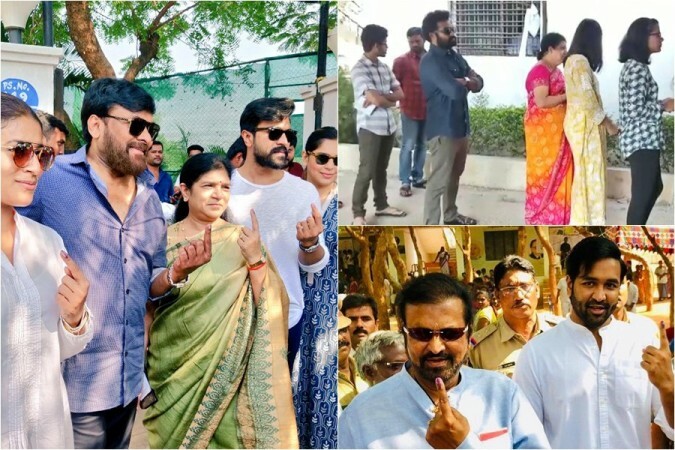 #LokSabhaElections2019 #APElections2019"
Young tiger Junior NTR also took a break from the shooting of SS Rajamouli's movie RRR to the polling booth with this family. After casting the vote, the actor tweeted the photo of his inked finger and wrote, "We got inked! Did you? #GoandVote"
Music director MM Keeravaani of Baahubali fame tweeted the photo of his inked finger and wrote, "Done early in the morning. Avoided sonstroke "
Madhura Sreedhar Reddy: Just voted! Mood of the nation is for bright nation! Viranica Manchu: Wish @ysjagan anna all the very very best for today!